I installed Trillian Astra Build 78 (I’m an alpha tester as well) via Wine 0.9.61 today and got a couple of errors. I’m using the very latest version of Wine and the very latest release of Trillian in this test. My operating system is Ubuntu 8.04 x86_64. dwmapi.dll error. I downloaded a copy from dll-files.com and configured Trillian Astra to use Windows XP settings and linked the dwmapi.dll library after placing it in the trillian install folder. The results were, Trillian Astra started and allowed me to sign-in to the astra service and launched the buddy list, but the rendering was terrible. It was un-useable. Then I started getting error pop-ups about explorer.exe that seemed to be related to:fixme:xrender:X11DRV_AlphaBlend not a dibsectionThey would only popup when I would move the mouse over Trillian Astra or the Trillian tray icon. I’m looking further into this. Maybe there is another library that can be replaced. 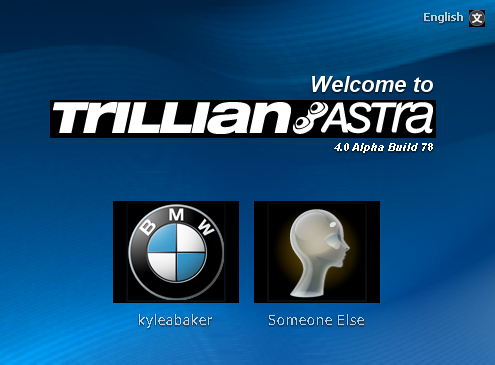 I’ll be back with some updates and hopefully screenshots of Trillian Astra working under Wine! I can’t seem to find anything useful searching google about most of these errors that Wine is returning in the console. The rendering is still off, but at least it is legible. The buddy list window is a mesh of horrible rendering lines. It’s not clear enough to use. That’s the main thing that I’m working towards now. As long as the errors aren’t crashing Trillian, I can work towards getting it to render properly and then focus on catering to the warning errors. 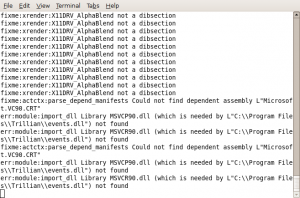 Have you got the MSVCP90.dll in your system/system32 folder? I typically the MSVCP90.dll file is located inside of a folder somewhere in the c:\Windows\WinSxS folder. There was actually already a msvcp90.dll library file in the Trillian install folder. I’ll try putting one in the system32 folder and let you know what happens. Have you got Astra working in Wine this way? Previous Previous post: Happy Cinco de Mayo 2008!